Hello! I'm back from a week at the beach feeling relaxed and refreshed. The beach restores my soul like no other place. It's a blessing to be able to get away to such a beautiful location, connect with nature and spend time with my husband and two dogs. We had a really great time. 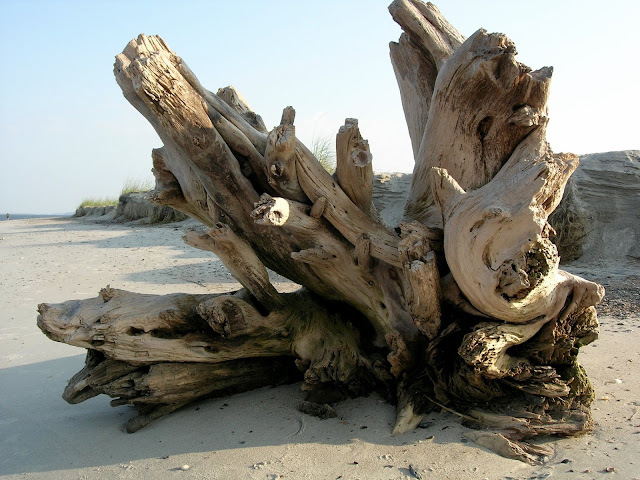 We've been going to Edisto a long, long time, and it feels like a second home to us. We were very fortunate this year to have had nearly perfect weather -- only one day of rain, but even that didn't deter my husband from fishing. He caught two red drum, several speckled sea trout and a few other fish. I used the time to catch up on some reading, which I'll share in another post. Each morning we got up early to watch the sun rise as we drank our coffee, then headed to the beach with the dogs while it was cooler so they could get some exercise. They loved it! We had the beach almost completely to ourselves in the early morning. There were good breezes to keep us cool -- and no bugs! During the heat of the afternoon, the dogs and I enjoyed the shady screened-in porch overlooking the creek, while my husband canoed and fished in the marsh. He nearly hooked a four-and-a-half-foot shark on his fly rod! He had some awesome, super-close dolphin sightings, too. From the way the dolphin were behaving, he was fairly sure they were mating. The wildlife sightings from the house were awesome as well. From the porch we saw a manatee surface in the water between the edge of the property and the boat dock. We couldn't believe how close it was! We'd heard about a manatee that frequents the area, but had never seen it until this year. Very exciting! The next day we spotted it again, but this time it was in the sound. There were several older kids out in the water swimming, completely unaware that the "sea cow" was so close by. We mentioned it to the parents so they wouldn't be alarmed. They had seen it, but didn't know what it was. Not long after, they called their kids in from the water, but I think it was because the waves were picking up and the water getting rougher, not because of the manatee (which is a harmless plant-eating creature). Another day I had the pleasure of spying a river otter. I can thank a little Green Heron for that. He was raising such a commotion over the otter, and my curiosity was piqued. It's amazing what you can notice in nature when you open your ears and your eyes and pay attention. 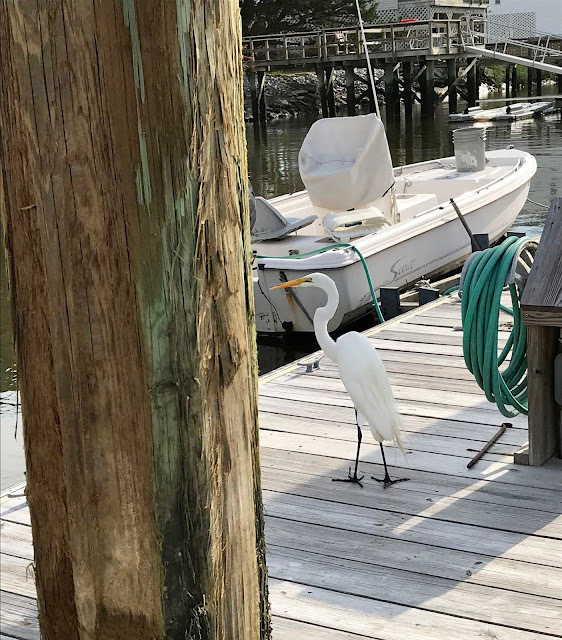 I walked down the pier to see what the bird was so upset about, and there was the otter on a floating wooden platform between a neighbor's boat and the dock. I could hardly believe my eyes. I'd never seen an otter in the wild before. I had my phone with me, so I videotaped it the best I could, while yelling "Otter!" to my husband who was out on the deck playing guitar (he thought I was yelling "Louder!" Ha!). The otter then began rolling around on its back, the way our beagle does when she's happy. It didn't seem to mind at all that I was standing so close by (and yelling). Then it glided gracefully into the water and was gone. What a special moment! The house we stayed in faces north, so we had spectacular sunrises (above) and sunsets (below). 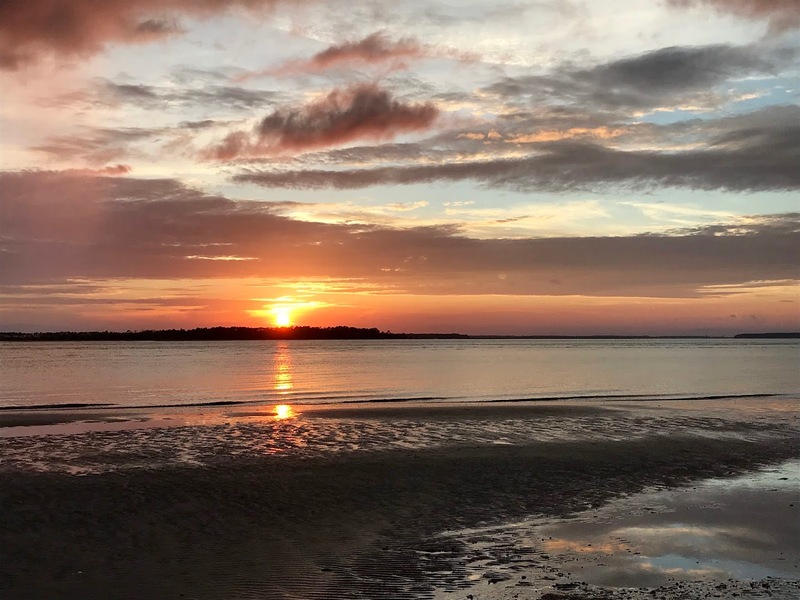 Each evening we'd hop in the car with the dogs for the short drive to the sound to take in the breathtaking sunsets and the nightly dolphin "show." Dolphin like to feed and congregate at the point where the sound, creek and river meet. They put on quite the show for us, at times jumping clear out of the water. I never get tired of watching them. When the sun was almost completely set, and most people had left the beach, we'd walk with the dogs and enjoy the cooler temperature and get some end-of-the-day exercise. The dogs would be worn out by the end of the evening and slept well, as did I. 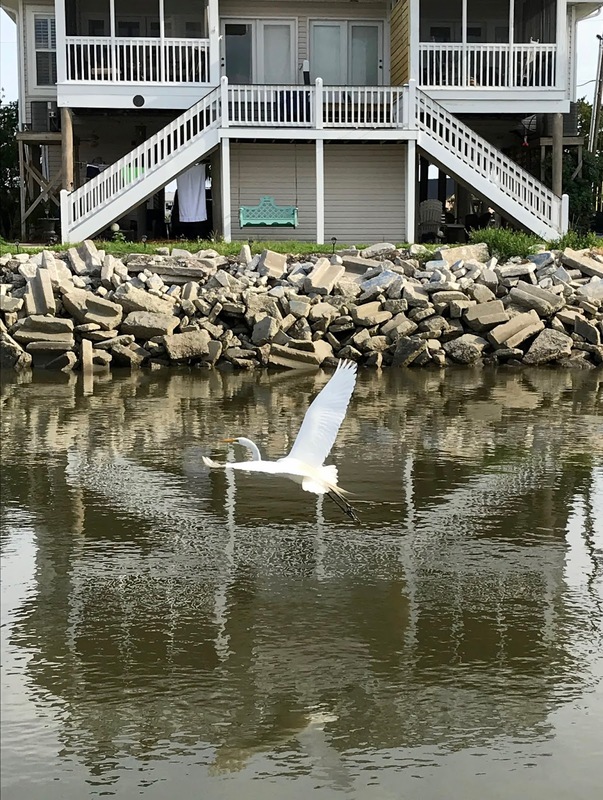 The photo below shows the house and the proximity to the water where we saw the manatee, right about where the bird is. Being on the creek provided day-long bird watching opportunities. Below is a Great Egret, which has a yellow-orange bill and is much larger than a Snowy Egret, which has a black bill, black legs and yellow feet. We also saw Green Herons, Tricolored Herons and Snowy Egrets, brown and white pelicans, and various gulls. What are your summer vacation plans? Do share by leaving a comment -- just click on "Comment" below. I'd love to hear from you! Thanks for visiting My Little Bungalow. I hope you have a wonderful summer. We have owned a house on Lake Keowee in Partnership for 19 years and it is our home away from home. We always spend a week there in July because we like to wait until the lake warms up. This week we bought a Class B motor home so our travels may take us anywhere now that we are retired!